Steam might rule the PC gaming marketplace domain, but when it comes to in-game chatting Discord is the leading party. Discord has plenty of features and a better connectivity that gamers ideally prefer over Steam’s native solution. Now, in an attempt to battle this supremacy of Discord, Steam has announced in an official post that it is rolling out its new text and voice features, as well as its updated friend’s list, to all users starting today. The new update brings Steam Chat some popular and much-needed Discord-like features into the Steam client. The new update brings a redesign and adds more functionality to the chat service. Users can now share GIFs and rich social and video links with friends, sort friends by favorites, group your friends by game and by party, and maintain richer group chats, which is quite similar to what Discord offers. The new update also adds a built-in voice chat with channels and link inviting. 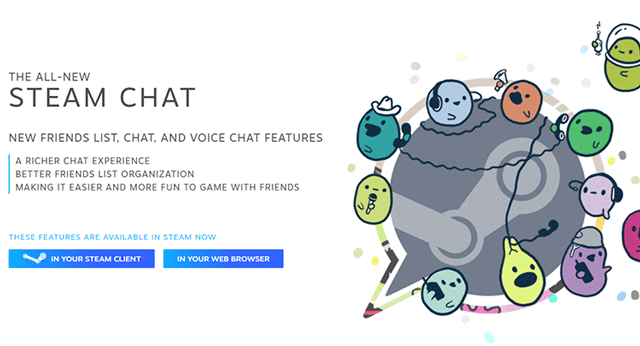 With over 130 million users in a little over 3 years, Discord has grown and become the most preferred voice chat app for PC gamers. In fact, owing to its popularity, it’s become a popular social chat platform in its own right, with public and private communities and group chats existing as well. Many companies and gaming groups have dedicated Discord channels; for instance, if you’ve been following the PUBG or PUBG Mobile Channel, you’d realize some of the updates are posted way earlier in the Discord chat rooms, as opposed to posts on Steam or blog posts. Having said all that, Discord, despite having a massive user base, does not seem to be converting into a marketplace as well, and even if it did, it would be hard to shake Steam off of its throne. So it makes all the more sense for Steam to make its platform more robust in this regard.